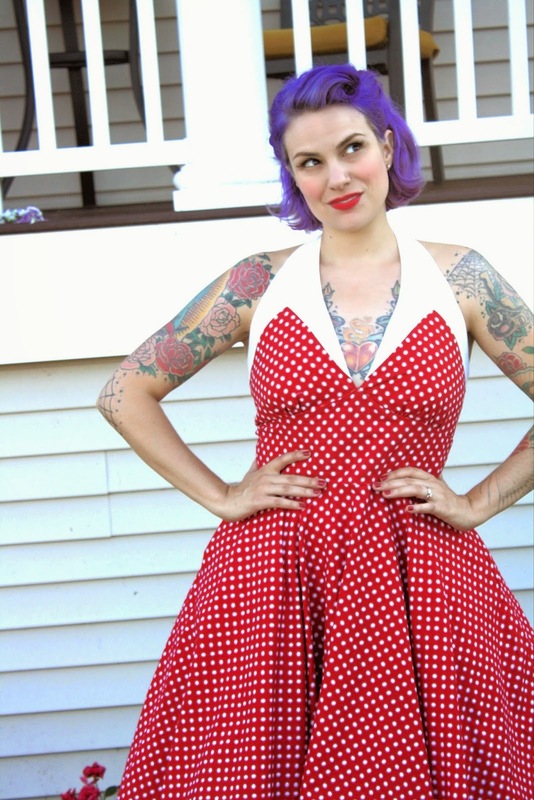 When this pattern was released on the Butterick website, I was instantly smitten. In fact, I loved it so much I made a near-replica of the model garment. This is one of the quickest projects I've sewn in recent memory. I was at my parent's house in Arizona and decided to give it a try. I made a muslin and then the rest of the dress in half a day. Super satisfying. I got the fabric at the local quilt shop out there. The white halter is Kona Cotton and the rest is a quilting broadcloth cotton print. It softened up nicely by prewashing. I would definitely recommend making a bodice muslin of this design. The bodice was significantly too long for me, both in the halter portion and in the midriff. It also was very wide underneath the armpits, so I narrowed it. The size 14 was too big for me overall. I took it in at the side seams, but wish I had taken more out at the waist. If I were to make it again, I would put a bit of boning in at the side seams and on either side of the zipper for support so the lower back doesn't wrinkle. I didn't have any of that stuff with me in Arizona, so I decided to do without. I did add bra cups, post construction. The skirt is a full circle (with pockets, yay!). 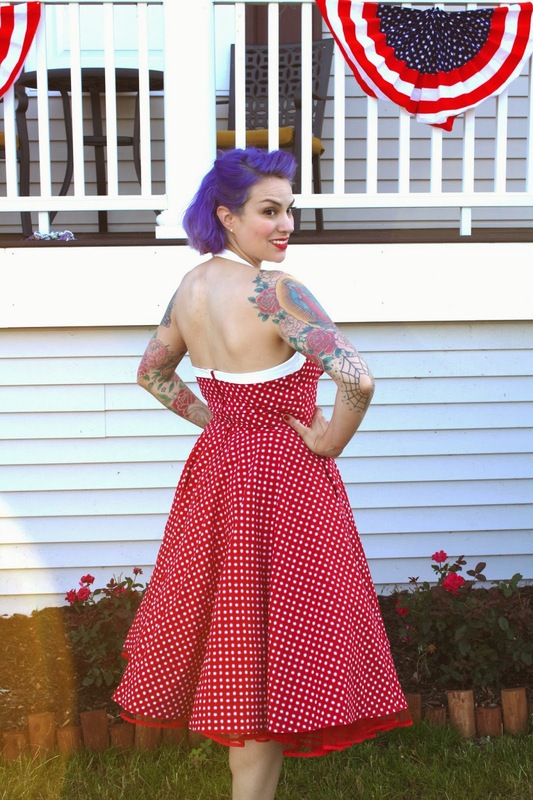 I wore it with a crinoline peeking out for dramatic effect, since I wore it for a 4th of July performance. It looked pretty great on stage (if I do say so myself). The skirt kept blowing up, since it was a windy day, so I was glad to have the crinoline underneath. Overall, I highly recommend the pattern but do know that you'll probably need to spend some time fitting it--and you may wish to size down altogether. I'll probably be making this again this summer--aqua and white, perhaps? Oh I love it! I actually thought it was one of your designs at first, because the example dress is just so "you"! Looks wonderful up on stage too! Oh that looks terrific! And super flattering as well. :D The crinoline is a great touch and looks fantastic on stage! That dress looks super cool with your tattoos. Very flattering! Love it. 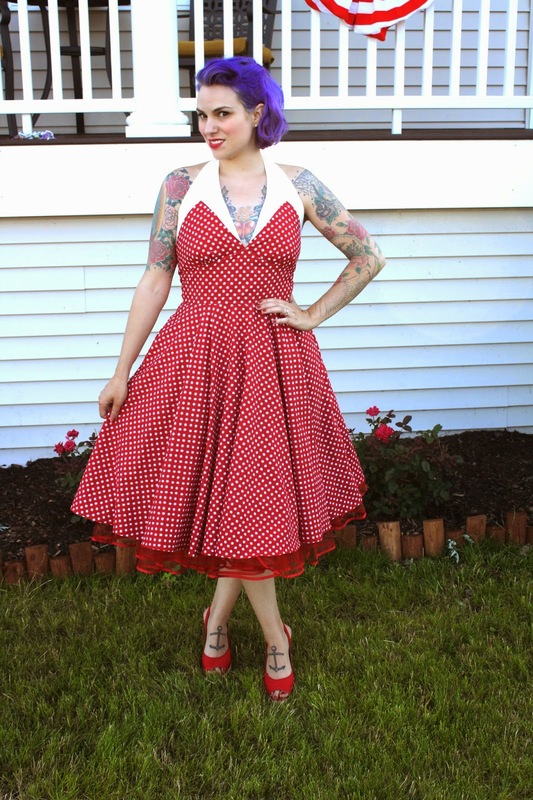 What a great dress, you look amazing, Gertie! 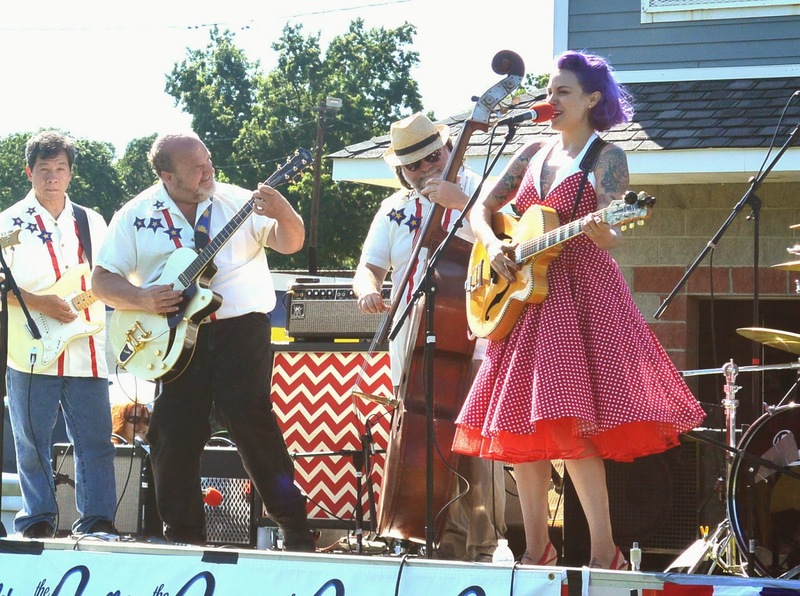 I forgot to look at the dress in action in that last pic because- whadda guitar! You've never been foxier! So what about a mod with an elastic back? Shirring, or elastic casings? Excellent! Great looking dress, Gerty. I thought about buying it at the last pattern sale. Thanks for the review. Holy Mackeral! This is such a FAB-U-LOUS dress!! Gingham is catching my eye these days. Being a large gal though I'm just not sure. Thankfully it is not overly expensive and I could always wear it only at home if I decide I look too clownish in it. 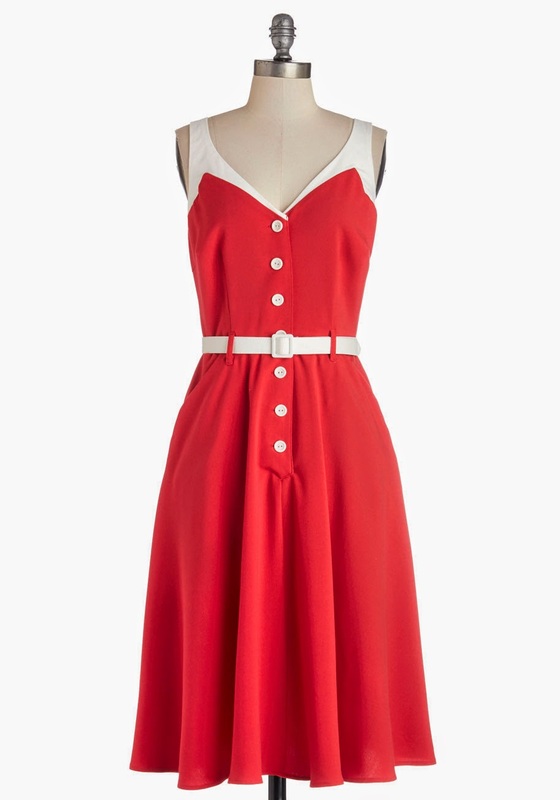 I would like this dress non-halter to cover up back fat. gorgeous! 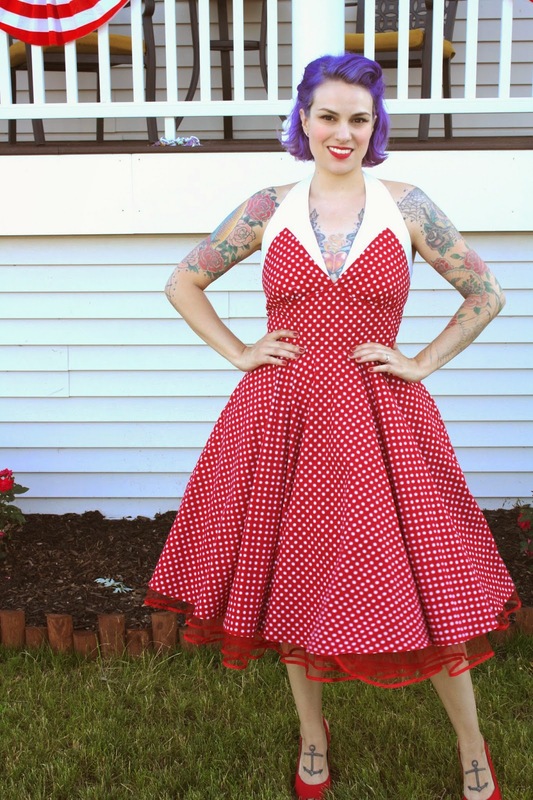 yours is so much cuter than the modcloth dress & i love the crinoline! It's fabulous and I'm jealous. I'm not ready to spend the time I need to fit this yet, since I haven't gone back to my pre-baby body -and that wasn't anything to write home about, lol!. I'm definitely putting this on my to-do list, though. I literally just cut this pattern out!, I'll keep in mind of your changes, I'm only 5'4 and generally cut out a size 14 as well. I plan on getting a polka dot skirt and doing a completely white top with piping or flat bias where the bodice cups and halter meet with left over skirt fabric and put some bra cups in as well, and i love boning so probably some of that now! I'm glad it was easy for you to put together its an adorable dress. It's a good thing you had a crinoline under your skirt; sure saved you from a wardrobe malfunction! Wish I could have seen you perform! Does anyone in your audiences recognize you as blogger "Gertie"? The skirt part of that dress is fantastic - and it really suits you! So spots are "in" this summer (or polka dots.) I nearly bought some cotton like that recently. Gertie you are a talented gal! What a gorgeous dress! You are so talented to have made it yourself! I really want to learn how to sew my own clothes too. What do you recommend as a beginner? Are there any good books? How did you learn? I just got this pattern recently too! I love it very much, and I am even more excited about making since seeing yours. It's fantastic. I'm so glad you made it first so you could give us the extra little tips. Thank you.